When I built this last computer for my mom, we decided to throw a memory card reader into one of the available 3.5" external drive bays. While it's not something she uses regularly, it's nice to have on hand for for reading the memory card out of her phone or camera occasionally and it also has an additional USB 2.0 port in it as well. Also, since it was only $6 on sale it wasn't really going to affect the price of the build much, so there was little reason not to include it. I'd picked up a similar card reader in the past for a previous build, and it was a little short and only had one mounting screw location on each side. It sat in the case fine but it did pivot a minuscule amount up and down because there was only one screw holding it on each side. 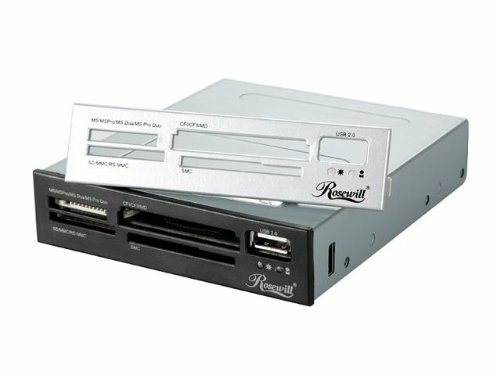 This Rosewill RCR-IC001 card reader didn't have that problem because it's longer and takes advantage of both screw mounts on each side of the device, which makes it feel more stable and secure in the case. The card reader also comes with a changeable front panel. There is a black face plate installed out of the box, but there's an additional silver face plate in the package in case it matches your case better. It's easy to change with one little tab to depress on each side to make it pop right off. Hooking the device up to the motherboard is also easy, as the connection consists of a single USB 2.0 cable that you run to one of the USB headers on your motherboard. The cable is probably 18" long so there's plenty of length to make it reach wherever you need to on your particular motherboard. I ended up using a zip tie to tie off a loop of extra slack and laid it under the drive, out of the way. This device is a 40-in-1 memory card reader, but when they say "40" they really mean "5 types and most of their variations". It supports Compact Flash, Memory Stick, MultiMediaCard, Secure Digital and SmartMedia cards. Many of the variations like miniSD, microSD and MS Pro Duo only work with the appropriate adapter that may or may not come with the memory card. The device also supports the SDHC (Secure Digital High Capacity) format that is prevalent in most phones and tablets these days. The card reader works by having four different slots in the face, along with a USB 2.0 port and a couple of LEDs for activity (green) and power (blue). The top slot on the left is used for MS/MSPro/MS Duo/MSPro Duo, and the top middle slot is used for CFI/CFII/MD cards. The bottom left is for SD/MMC/RS MMC and the bottom middle is for SMC cards. We've only used it with SD cards (and microSD cards with the adapters) so far since that is the only type of card that any of us have laying around. SD cards must be inserted upside-down into the slot, but they worked just fine and were about the same speed as my external card reader. The slots are hot swappable and you can use multiple slots at once (as well as the USB port) if you have different types of memory cards, allowing you to transfer data from one to another. Supported operating systems include Windows 7/Vista/XP/2000/ME, and it also seems to work fine in Linux Mint (which implies it will likely work fine in Ubuntu and Debian, and probably most major Linux distributions). No drivers were necessary for me to install in either operating system. The device can be operated in temperatures ranging from 0ºC to 50ºC at a humidity between 10% and 95%. The package contains the card reader itself, four screws for mounting the device, the extra silver face plate, and a folded up single-page user manual. The manual contains a brief introduction and specifications in seven different languages on one side, and surprisingly clear installation diagrams and instructions on the other. This device is made in China and backed up by a 1 year limited warranty. Overall this was a good purchase and I recommend it. You can usually find it on sale for $6 or $7 and it's just one of those things that is nice to have on hand even if you don't use it too often.